I’m wondering where I can go to buy a T-shirt for the Preckwinkle/Lightfoot concert tour. Because judging by the way the media strategy is for this mayoral race, it sure looks like one. The only difference is you can’t boo the opening act because there isn’t one. 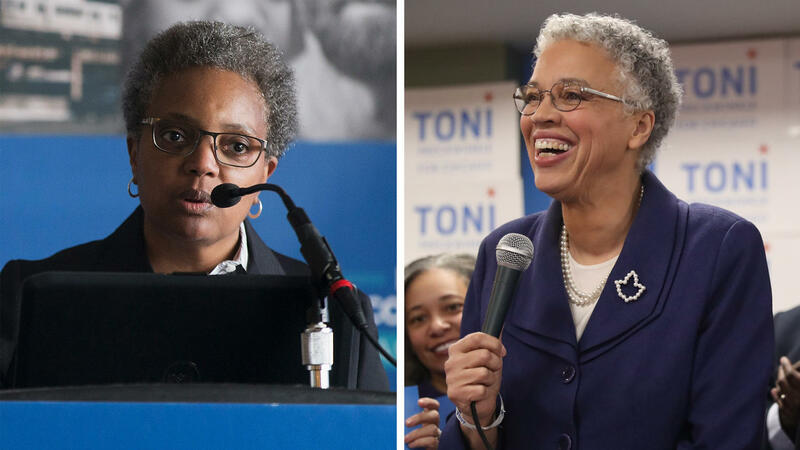 As you know, mayoral hopefuls Toni Preckwinkle and Lori Lightfoot are competing to become the first African-American woman to occupy the fifth floor of City Hall. But the way to watch the candidates debate the issues has been quite orthodox. Unlike Presidential campaigns where the major networks simulcast at least three debates, both Preckwinkle and Lightfoot decided to “tour” local TV stations to debate – one by one, making this seem more of a “press junket” more than anything else. This week, three local stations – Tribune’s WGN-TV, Fox’s WFLD-TV, and CBS-owned WBBM-TV plan to run these “mayoral forums” where a news anchor or political editor moderates a discussion between the two candidates. In the last three weeks, both made stops at NBC-owned WMAQ-TV, ABC-owned WLS-TV, and WTTW’s Chicago Tonight. Second, the number of “forums” are way too much. While I guess you can welcome as many opportunities as possible for Lightfoot and Preckwinkle to debate the issues, you run a risk of the candidates becoming repetitive. Third, the scheduling of these forums airing are completely asinine. While I understand we live in an era of “on-demand” streaming and DVR use, scheduling them in the “prime access” hour (6-7 p.m.) is quite inconvenient for many people who are just getting home from work. Older viewers – the ones who most likely to vote – are also less technology-savvy, preferring to watch TV live rather than seek something out online. Moreover, local TV news websites aren’t exactly hot destinations for young voters (and their video players for the most part, don’t work very well.) Of the six stations, only WGN-TV and WTTW scheduled the mayoral forums in prime-time, between 7 and 8 p.m. But you also have to question the lack of cooperation between the city’s TV stations as the reasons for so many of these forums. They’ve partnered before in carrying mayoral debates, most recently in 1989. So what’s different now? I guess you can chalk it up to the continuing deregulation of the media business, where stations don’t have to meet public interest obligations as much as they did in the past. Plus, given the competitive nature of the television business here, partnering on debates is obviously out of the question. And you thought the two candidates didn’t like each other. In addition, suburban and northwest Indiana viewers – who comprise more than 60 percent of the Chicago DMA – aren’t as interested in the Chicago mayoral race, and wouldn’t like their prime-time programming pre-empted – even in an era of streaming and delayed viewing. Perhaps the best thing is the lack of TV advertising, with Preckwinkle’s decision to scale back. But in one of the most bizarre campaign ads in recent memory, a Lightfoot commercial features her daughter acting up in the background. With poor poll numbers, Preckwinkle might want to consider featuring Samuel L. Jackson, Spike Lee, and Charles Barkley from Capital One in her next political ad. In a city having trouble dealing with education, financial issues, and crime – not to mention a national reputation shot to hell, these debates fall short in addressing these issues. These televised “forums” do absolutely nothing for the voter and makes one wish Beto O’Roarke, Kamala Harris, or Alexandria Ocasio-Cortez were running for mayor instead instead of these two candidates in a “historic” context that really means nothing.